The brewing process begins with malted barley. Barley is malted by soaking it in water, allowing it to begin germination, and then drying the partially germinated grain in a kiln. Malting grain produces enzymes that convert starches in the barley into fermentable sugars. Different roasting times and temperatures are used to produce the various flavors and colors in our beers. Most of our malted barley comes from the Canadian Prairies. 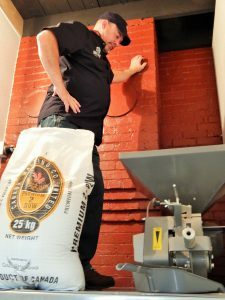 Our brew day starts by gathering the 55lb bags of malt needed for the beer we are brewing and sending them over to the mill room. The malted barley is then run through our mill, cracking the husk and opening each kernel to expose the enzymes in the endosperm. Once milled, the malt is sent by auger to the mash tun. The milled malt is mixed with hot water in the mash tun, allowing the exposed enzymes to begin converting starches into sugars. 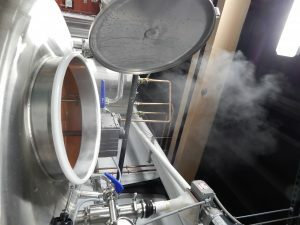 Once the conversion is complete, which takes an hour, the sugary liquid called wort (which becomes the basis of beer) is drained off and transferred to our brew kettle. The malt is now washed in a process known as “sparging”. This washing allows us to gather as much fermentable liquid from the malt as possible. Once enough of the sugar has been washed out of the grain it is time to boil the wort. The left over malt, referred to as spent grain, is picked up and used by a local farmer for feed. 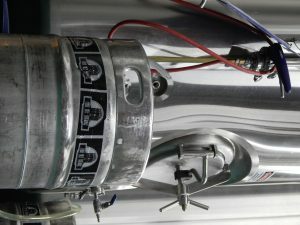 In the early stages of the boil, we add bittering hops. In later stages of the boil, we add flavor and aroma hops, which provide the distinctive citrus, pine and floral hop notes. The boil takes around an hour to complete and then the wort is whirlpooled to separate the hops from the liquid. The wort is then run through our heat exchanger which cools the hot wort down to 70 degrees, the perfect tempurature for our yeast. The hot water produced by the heat exchanger is then put into the hot liquor tank for use on the next brew day. Once cooled the wort is transferred to one of our fermentation tanks where all the magic happens. In the fermentation tank, the wort is mixed with yeast which gobble up the sugars and coverts them into alcohol and CO2, in a stage called primary fermentation. Primary fermentation can take anywhere from 5 to 10 days. 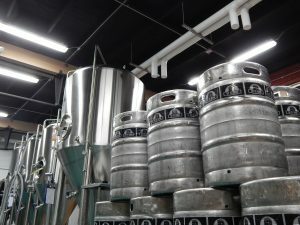 Secondary fermentation is where we cold condition the beer, which gives our beers their rounded and balanced character. This is done partially in the fermentation tanks and then finished in our bright tanks. bar or restaurant. Our brewing process is a labor of love. 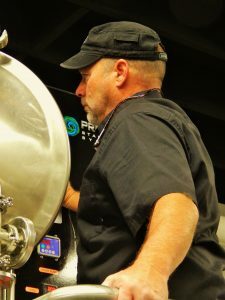 If you’re in our neighborhood, we invite you take a first-hand look into the entire brewing process.